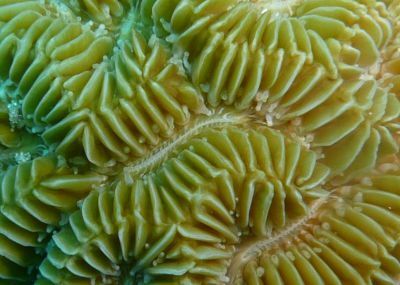 Coral communication with their endosymbiotic algae is crucial for coral survival. I am currently investigating the cellular mechanisms that regulate this symbiosis using a combination of live-cell assays, biochemistry, immunostaining, and whole-organism physiology. 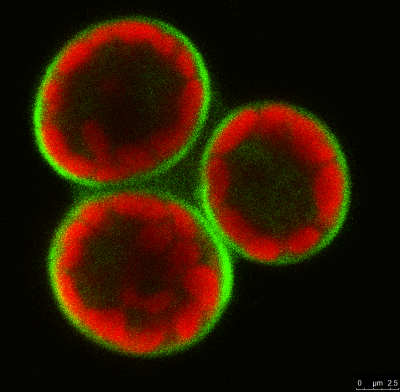 Image: Confocal microscopy image of a single live coral cell containing three Symbiodinium (red indicates chlorophyll fluorescence). Shown in green is the symbiosome, the intracelluar compartment housing each algal cell, which is loaded with a pH-sensitive fluorescent dye (Lysosensor Green). The green staining indicates that this compartment is acidic. We have a lot to learn about even the most fundamental pathways involved in regulating coral physiology. For example, we still do not know what proteins supply the coral symbionts with the compounds they need for photosynthesis, how this process is regulated, or how these interactions vary between coral species and symbiont clades. Image: Fluorecence image showing the localization of a potential bicarbonate transporting protein (red) in the tissue of the coral Acropora yongei. Coral and Symbiodinium nuclei are stained with a dye that labels DNA (blue). Corals and other benthic reef macroorganisms are host to a diverse ecosystem of microorganisms, from their endosymbiotic dinoflagellates to their associated bacteria, archaea, viruses, and fungi. I am interested in understanding how different factors such as stress, host species, and competition influence the the dynamics of these communities, and the role these communities play in host physiology. Image: Various coral and algae species competing for space on the reef benthos. Carving out space is key for surviving on a coral reef. I am interested in understanding how corals fight for and maintain space on the reef, the role of microbes in promoting or hindering coral success, and how competitive outcomes are affected by human influence. Coral reefs are becoming increasingly dominated by seaweeds, making it important to understand how these competitors affect coral health and distribution.